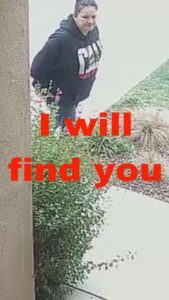 A social media-powered manhunt for a South County package thief led to the arrest of an Arroyo Grande woman and some celebratory Facebook posts by a Nipomo father. Kevin Beck ordered a lego package from Amazon for his young son. 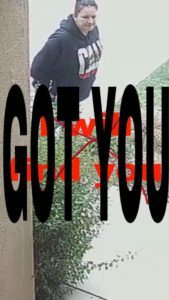 Beck did not receive the package yet Amazon said it was delivered, so the Nipomo father reviewed his home surveillance footage from the day of the delivery. Beck posted footage of the theft on Facebook, and the video circulated online and in the local media. Then, a person called the San Luis Obispo County Sheriff’s Office and anonymously reported the location of the suspect’s vehicle. On Monday evening, deputies located Monica Menchaca, 36, in the 800 block of Sheridan Road in rural Arroyo Grande. The deputies arrested Menchaca and charged her with being under the influence of a controlled substance and violating her probation. 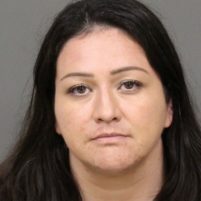 Deputies booked Menchaca in San Luis Obispo County Jail, where she remains in custody with her bail set at $20,000. A theft investigation is ongoing. Investigators are trying to identify other possible theft victims and recover any property that was stolen. Following Menchaca’s arrest, Beck posted her mugshot on Facebook. He also updated his Facebook cover photo to show surveillance footage of Menchaca with the words “I will find you” crossed out and the words “got you” in capital letters. “I could care less about the legos. Don’t F with me or my family. I will find you,” Beck wrote in a Facebook comment. It is sad that people need security cameras because stealing and crime is so bad these days. Again, our Judicial System, with the support of the voters have allowed this scumbag probably with a pat on the back to go out on probation and commit another crime to feed her habit! The only criticism I have with Beck is his characterization of this person as “lady”. I know ladies Mr. Beck……….and this is no lady. Here you’ll find the best use for social media and technology. Catching and shaming dirtbags. People raised by wolves have no internal compulsion to do the right thing, it is up to us to shine a light on them. Will she be ridiculed well beyond the scope of her crime?… YES! She is an example and its supposed to hurt. As we witness an already apathetic criminal justice system redefine “non-violent” crime, perhaps we can make up the difference in our own community. Monica, nice example for your kids (i’m taking a guess here)… Also a good warning for the community on how they are being raised.